MAGCO JIB CRANES are big money savers for every Industrialist and Business man MAGCO has a solution for any localised material handling with a specific jib crane and lifting tackle from a wide range of types and Capacities. For localised handling of any load or material economically, safely efficiently, in a minimum floor space, nothing beats a standard MAGCO JIB CRANE. A full range covering entire lifting needs is now available with MAGCO - the nation-wide leader in lifting gear. Three main varieties of Jib Cranes are available. Free standing (Self-supported), Wall bracket mounting, and King Post Mounting, in capacities upto 10,000 Kg. All Jib Cranes are desinged maintaining working stress well within the limits as per available and relevant I. S. specifications. Deflections of Jib Arm can be restricted as per customers actual need, based on cost and design. MAGCO Jib Cranes are desinged to occupy minimum floor space and maximum approaches. Easy erection features are in-built characteristics. All self-supported models can be wired internally rom isolators to Jib Arm through Slip rings, thus making the crane safer. Predetermined machine locations and Pilot pads make it easier in erection and alignment of every Jib crane. In most cases, Jib arms are adjusted by single nut, tie rods. All Jib cranes are fitted with self-alignment anti-friction ball/roller bearings for efficient and smoother service for long periods. 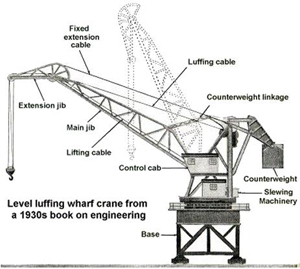 Special Tailor-made Jib cranes can be designed to suit the exact requirement of lifting application. Accessories: A full range of accessories like Slip-ring units, swivel limiters, adjustable stops, out-door covers, motorised swivels, manual/electric, chain/rope lifting tackles all types of slings, clamps, lifting beams etc. can also be supplied. Full support of our independent service/after-sales wing specialised in erection and maintainance of these equipment is offered with every sale. Please write to us for your full requirements. Can be self-supported on its own foundation, Optimum use of low head room characteristic. Can be of motorised swivel or manual swivel type. Any localised material handling. Open yard or indoor. Low head room and standard versions available independent of your factory building. Free-standing on its own foundation. Any localised lifting need inside the factory building. Low head room and standard versions available. Over-slung configuration in low head room version maximises the height of lift. Can be mounted on your factor column. Machine loading or Assembly line use. Maximum operating height, bracketed construction for easy erection. Reduced turning moment on your column. Indoor, in assembly line or on shop floor. Motorised movement for all motions. Quick and swift handling of components in assembly or any shop floor. In large Bays under heavy EOT Cranes for quick handling of smaller components. Operating Radius upto 35 metres. Working Height upto 29 metres. Self-rising column and jib arm, turning movement reduced to minimum with counter-weight. Easily adaptable to various applications at contruction, building and similar work spots. General Cargo, handling or grabbing in ship yard, ports, warehouse, floating docks, etc.